Little Hen is a little gem located in Apex. The restaurant has about 10 tables, and reservations are recommended especially during the weekends. Little Hen is a true farm-to-table restaurant; their meat and produce come from within 40 miles of the restaurant, and their cheese comes from within the state. All of the tables at Little Hen are draped with white tablecloths, and farm-fresh flowers are placed in the middle. Modern meets country elegance at the restaurant with sketches of farm animals on chalkboards decorating the walls and shabby-chic chandeliers hanging from the ceiling. Little Hen is definitely perfect for a special occasion. Our server Marcus was extremely friendly and helped us to decide on drinks. We started off our evening with a few North Carolina beers; Little Hen only has N.C. beers on draft and in bottles. Marcus then brought us out a starter. 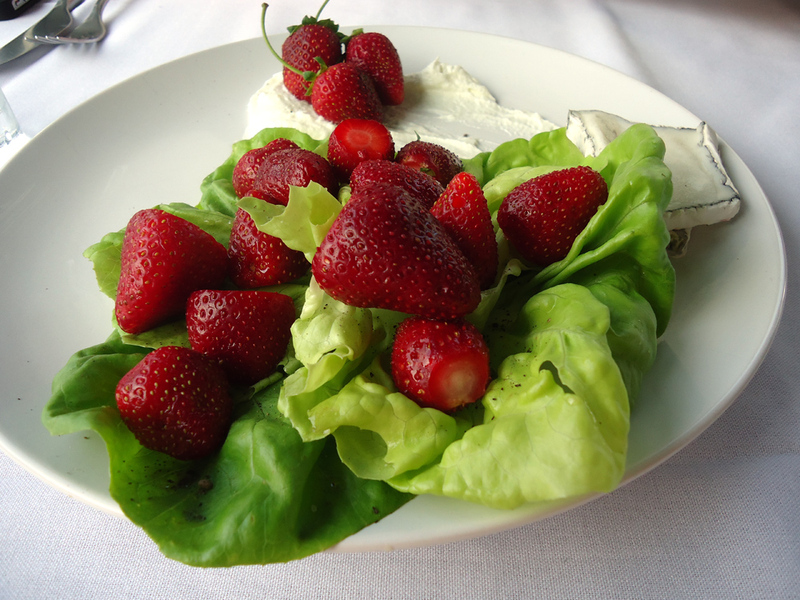 Fresh Boston lettuce topped with strawberries and sherry vinaigrette was paired with a side of Looking Glass Pack Square, Brie-style cheese. Delicious and fresh! Our group ordered two other appetizers. 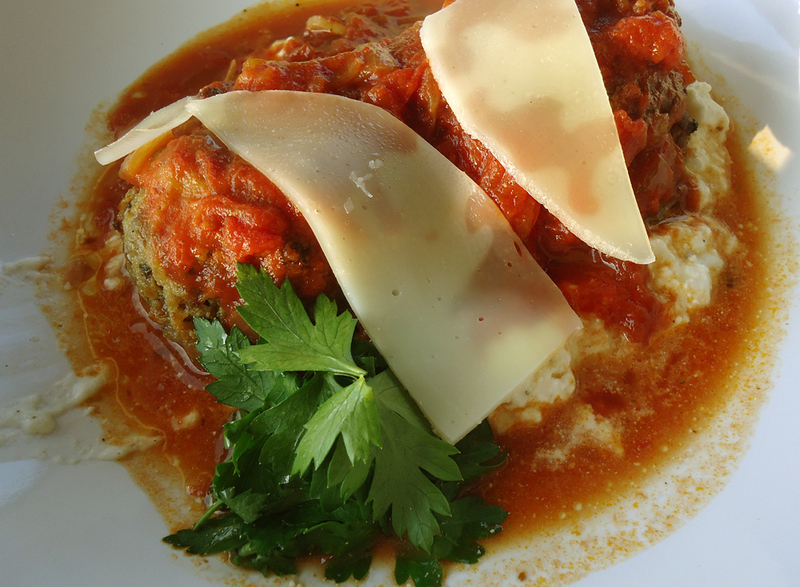 The first was smoked “marrow-nara” and meatballs; mozzarella stuffed beef and pork meatballs in a smoked bone marrow tomato sauce, topped with aged provolone and ricotta cheese. The sauce was exceptional and gave the dish a rich, smoky flavor. The next appetizer was crispy sweet fingerlings with prosciutto bits, herbs and prosciutto aioli. The sweet potatoes were amazing. The outside of the potato was crispy. 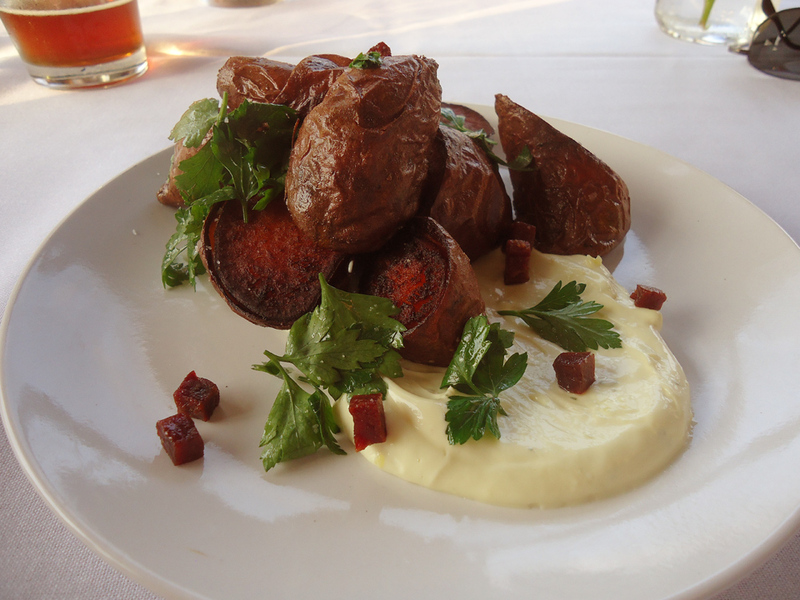 The prosciutto bits and aioli added a savory flavor to the dish, pairing nicely with the sweetness of the potatoes. Marcus challenged me to order the German Big Board for my main dish. The dish is literally a wooden cutting board piled high with food. 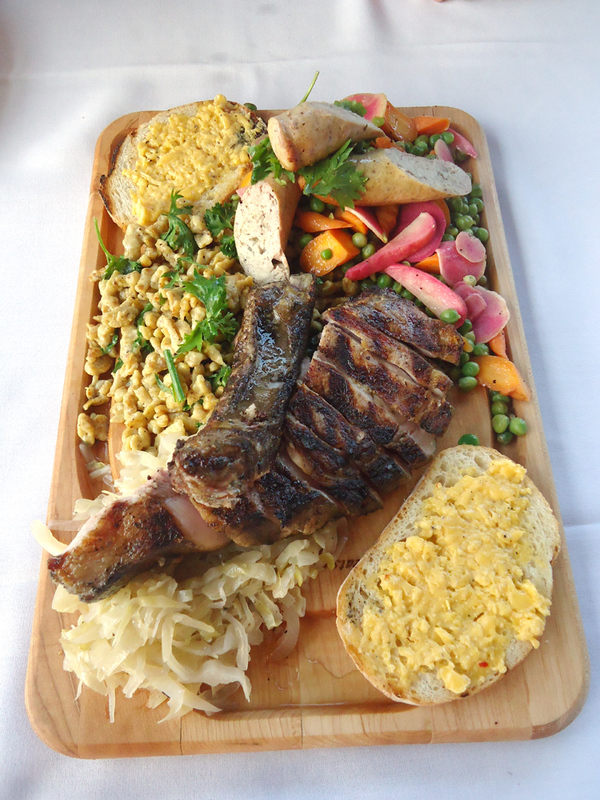 Seriously, the dish is massive and includes a pork chop, bratwurst, rye spatzle with herbs and mustard butter, braised cabbage, beer cheese and toast and spring peas, radishes and pickled carrots. I told Marcus I was up for the challenge as long as someone could split the German Big Board with me! My mouth dropped when the cutting board arrived to the table. Courtney and I had enough food to feed an army. The bratwurst was definitely my favorite: it was tender and contained nutmeg, which made the flavor unique. I also enjoyed the spring peas, radishes and pickled carrots. The produce was vibrantly colored, and the vinegar added a nice kick. You have to try one of Little Hen’s Big Boards; you’ll be glad you did. Just when I thought I couldn’t possibly eat anymore, Adam ordered dessert. There were three desserts on the menu so we decided to try them all. 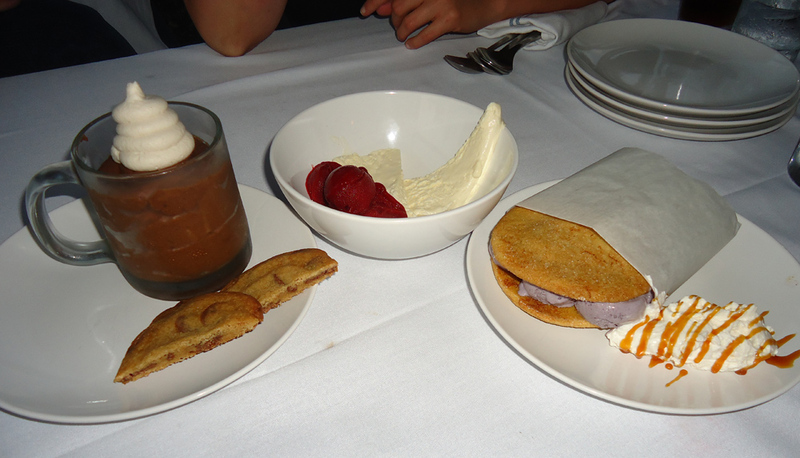 The first dessert was a chocolate chip cookie and chocolate coffee mousse with crème fraîche. The second dessert was a berry sorbet with a white chocolate semi freddo. Finally, the last dessert was two ginger cookies filled with blueberry ice cream and homemade whipped cream with caramel sauce. Each dessert was wonderful. I personally liked the desserts with fruit, especially for the summertime. With a menu that changes weekly, you better believe I’ll be back to Chef Regan Stachler’s Little Hen.